This year the hot weather seemed to hang on much longer than normal, with low 100's right up through the end of September. As tedious as the weather was, it allowed for some great late season dragonfly activity. 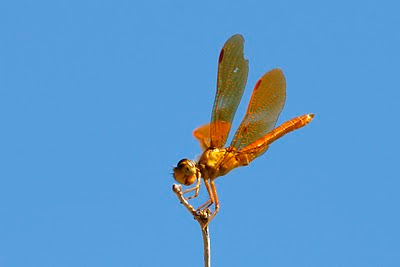 On an October 2 excursion to Boyce Thompson Arboretum, there were many species of dragonflies and damselflies active. None were more prolific than the beautiful Mexican Amberwings (Perithemis intensa), which numbers in the dozens, if not hundreds, at Ayer Lake. Like butterflies, adult dragonflies only live for a couple of weeks, and often display worn and torn wings, as the one above shows. 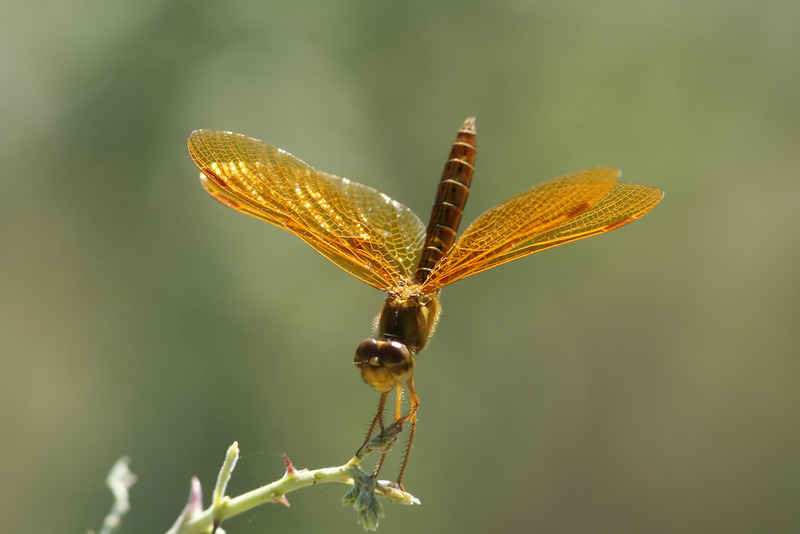 In most of Arizona, the Mexican Amberwing is the prominent amberwing, especially in central Arizona around Phoenix. The Eastern and Slough Amberwing is seen in the SE corner of AZ, though. The photo below show another Mexican Amberwing, focused on the wings. This provides an excellent look at the wings and vein structure. For those interested in identifying dragonflies in the southwest, I have two book recommendations. The first is a starter book that is small enough to be taken to the field. Common Dragonflies of the Southwest, by Kathy Biggs .